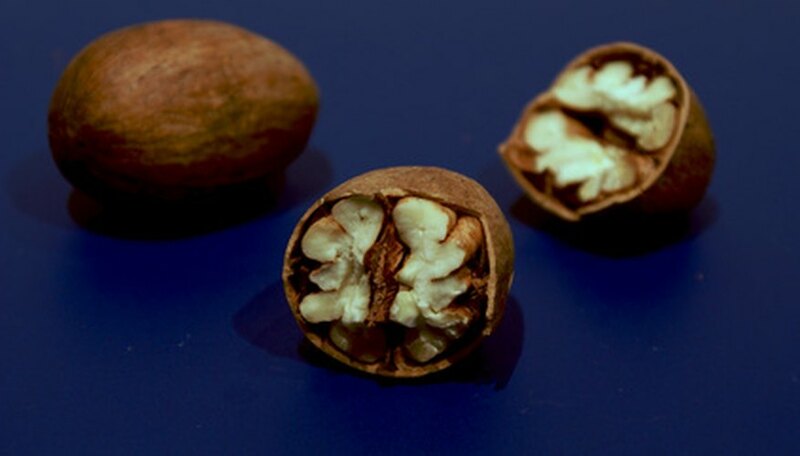 There are many grafting techniques that can be used to propagate pecan trees. Inlay bark grafting was developed in the 1950s and has proved to be one of the most reliable methods, successful even under adverse conditions. This type of grafting is best done in early spring when the sap of the rootstock tree is flowing. Rootstock is the tree onto which the graft is attached, and scion is the term for the stem or cutting that is being grafted. Cut the scion sticks from first- or second-year growth in late February and place them in a plastic bag with moist sawdust. Scions should be 10 to 12 inches long and roughly 1/2 an inch in diameter. Seal the bag and store it in the refrigerator until you are ready to graft. Select a rootstock tree with a 3- to 4-inch diameter trunk and saw it off cleanly about 4 feet above the ground. Use the saw and knife to remove the rough bark on one side of the trunk, being careful not to cut into the wood. Smooth the exposed area with the knife. Clip the bottom of the scion with the pruning shears. Hold the scion firmly and shave the wood down from just below the lowest bud to the bottom. The objective is to make a smooth flat surface that exposes the center of the scion. At the base on the opposite side, make a cut angled down and in so that the bottom of the scion is shaped like the tip of a chisel. Cut a groove into the clean surface of the rootstock that matches the width of the scion. Make it just deep enough so that the outside of the scion will be flush with the surface of the rootstock. Insert the scion with the flat side in and secure it with nails at the top and bottom. Wrap a large piece of aluminum foil around the top of the rootstock and the bottom of the scion to cover all of the exposed wood. Poke a small hole in the corner of a plastic bag and slide it over the scion until it is below the last bud. Use budding tape to keep the bottom of the bag snug against the foil. Poke another small hole in the bag just above the tape to let water drain out. Put a drop of glue on the upper end of the scion to prevent it from drying out. New growth should develop on the scion within six weeks. The bag and foil can be removed when the new shoots are 6 inches in length.